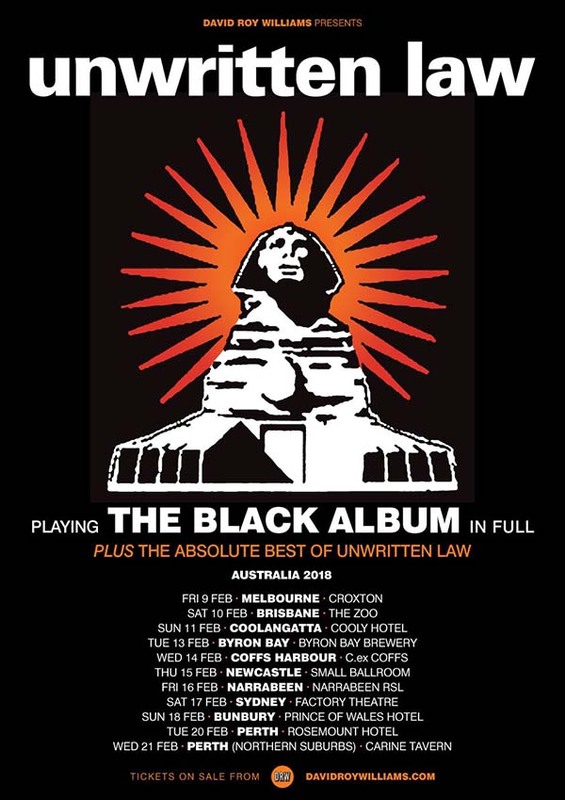 SoCal punk legends, Unwritten Law, are returning to Australia in Feb 2018 to perform their most celebrated record, The Black Album in its entirety from start to finish. Unwritten Law considers Australia be their second home, so it’s fitting that they return to celebrate the 20th Anniversary of the album that rocketed their careers from the local San Diego scene in to the mainstream charts. The band helped paved the way for power pop punk’s success, and it was fitting that the band appeared on sophomore Vans Warped tour as well as the festival’s Australia debut. White-hot songs including Holiday, California Sky, Cailin and of course, Teenage Suicide will blast fans into moshing ecstasy. The combination of raw guitars and melodic punk songwriting that made The Black Album a classic will be on full display in shows that leave fans sweating and shouting for more. Fans won’t just be treated to The Black Album (officially titled Unwritten Law) either. The band plan to unleash a veritable parade of devastation with monster tunes from their catalogue of punk eminence. Thrashfest hits such as Seeing Red, Up All Night, CPK, Rescue Me, She Says, Celebration Song, and Save Me will punctuate the sort of live shows that have enshrined the Unwritten Law in the punk hall of fame. Unwritten Law packed venues out on their last Aussie tour. This is the only time you’ll get to experience The Black Album in full so don’t run the risk of missing out on tix to witness this most committed of great punk bands in all their hard-hitting glory. Summer, beer, Unwritten Law, and The Black Album - February aint gonna get much better than this!